Business notebooks with the name ThinkPad are indispensable in the modern computer world. These devices represent reliability, longevity, quality and ergonomic design. Both IBM and Lenovo have introduced new features with great care and only sparingly. The last big change took place in form of the keyboard area, the last big IBM sanctum. 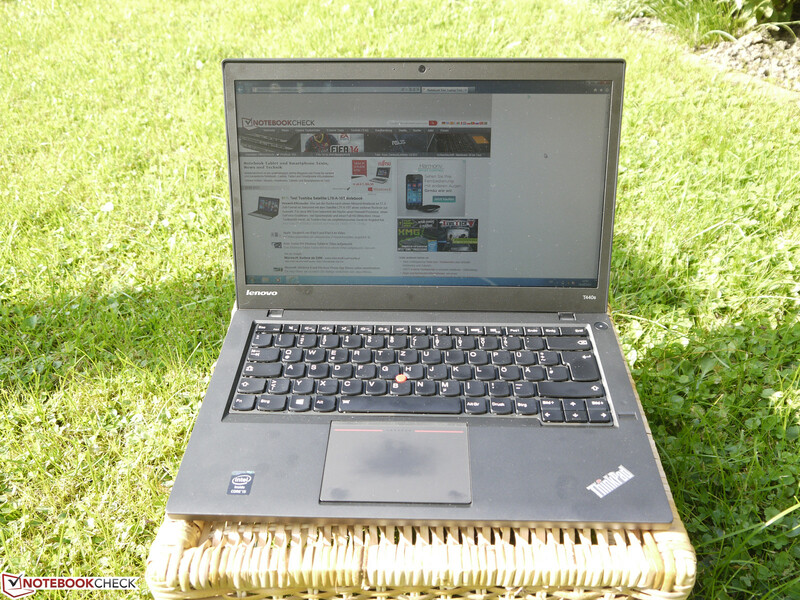 At first, this change was received with mistrust among the ThinkPad lovers, however, now much of the prejudice and doubt have disappeared and one gets to appreciate the advantages of the new input. The current ThinkPad T440s does not bring any such big changes, but it has a lot of minor changes. Whether these are all beneficial will be analyzed in our test. 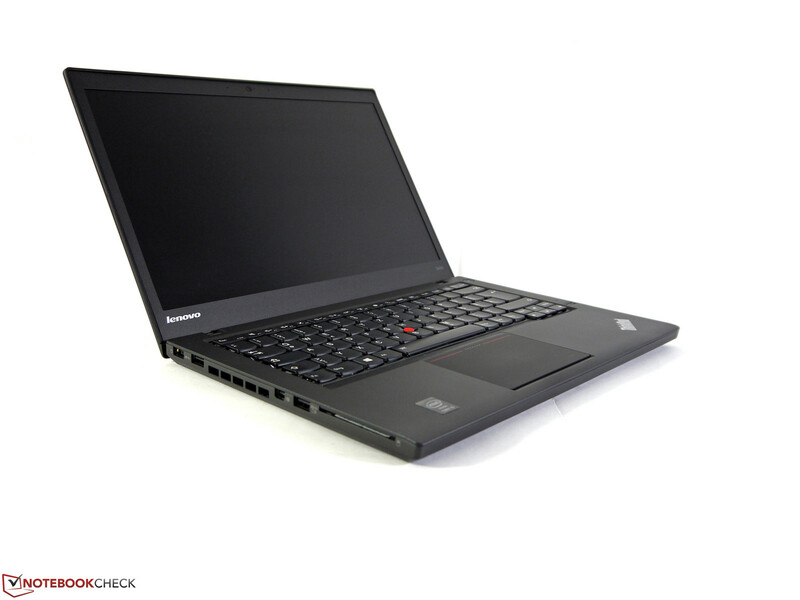 Our Lenovo ThinkPad T440s 20AQS00500 is equipped with an Intel Core i5-4200U CPU, 4 GB RAM, a 500 GB hard drive and a 14-inch HD+ display. It is a model of the Lenovo education program, which should also be a reason for the relatively low price of 960 Euros (~$1298), in addition to the missing operation system. New surface with smooth composition. The case is even slimmer than the T430s. Black is beautiful. The first impression shows clearly: color, overall presentation and recognizability are typical for a ThinkPad. 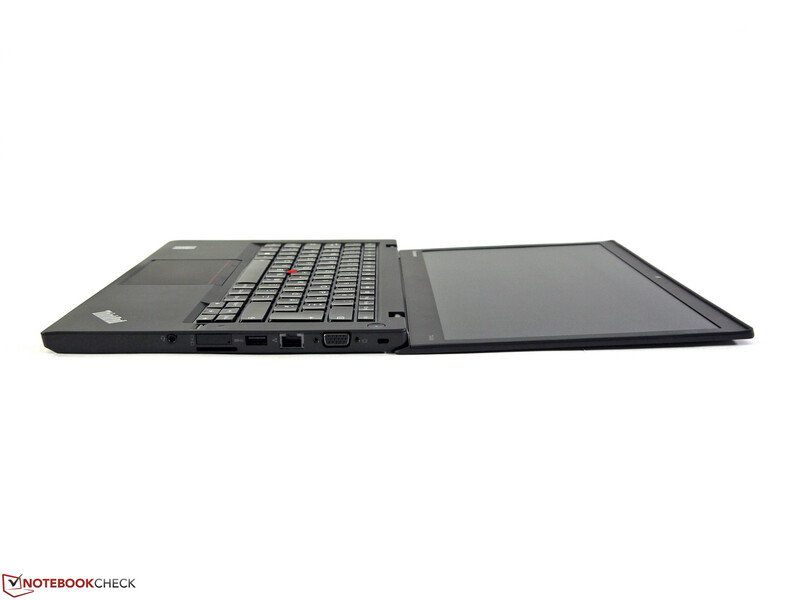 The very reserved exterior is appealing as always and it benefits from the prestigious ThinkPad label. Just like in the Edge and S series the dot on top of the i lights up when the computer is on. The label is now upside down and can be read from behind as well as when the laptop is open. 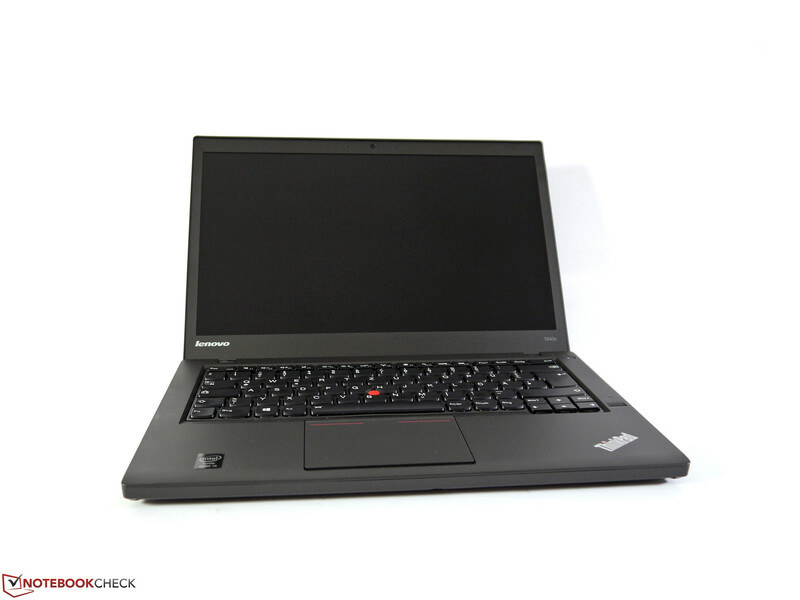 In comparison to its predecessor, the Lenovo ThinkPad T430s, there were even more changes in detail. The surface is smoothly textured and the haptic is a bit more pleasing than the rough plastic material of the older members of the series. The case seems more like an all in one piece and also shows much less clearance. Manufacturing is top for this test device and the stability of the case has also been increased. Only the display cover can be bent quite easily especially between the hinges. Furthermore, with pressure on the cover one can disturb the picture on the screen. When treating the laptop normally and with care these should not pose any problems though. 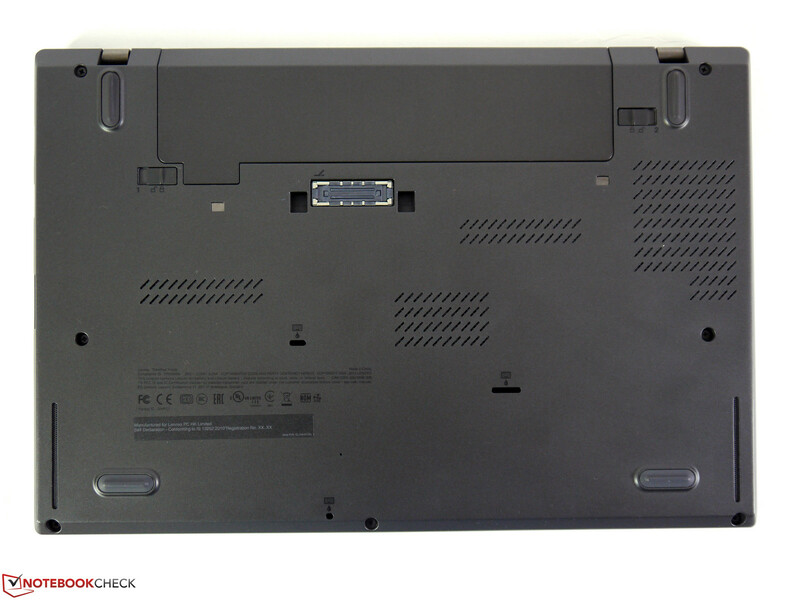 The clamshell design that was still included in part in the ThinkPad T430s has now disappeared entirely, the speakers on the side were replaced by more space for the keyboard, the track point and touchpad buttons are integrated into the 5 button clickpad, there is no more double hook closure and the separate audio buttons are now placed classically together with the other keys. The two display hinges hold the screen fixed in place, and a minimal bouncing only occurs in case of strong movements. 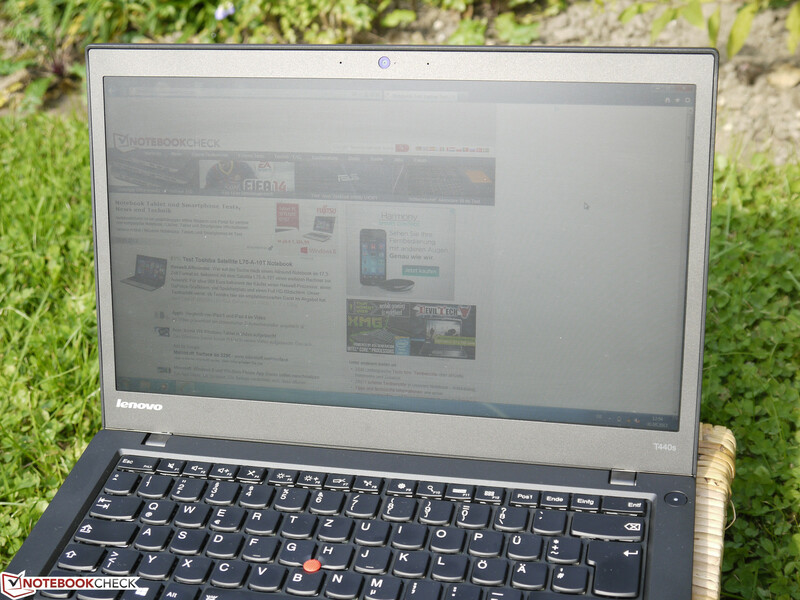 Lenovo was able to reduce the weight a bit through the appliance of magnesium and carbon. With a test weight of only 1.56 kg this is a very light 14-inch notebook. 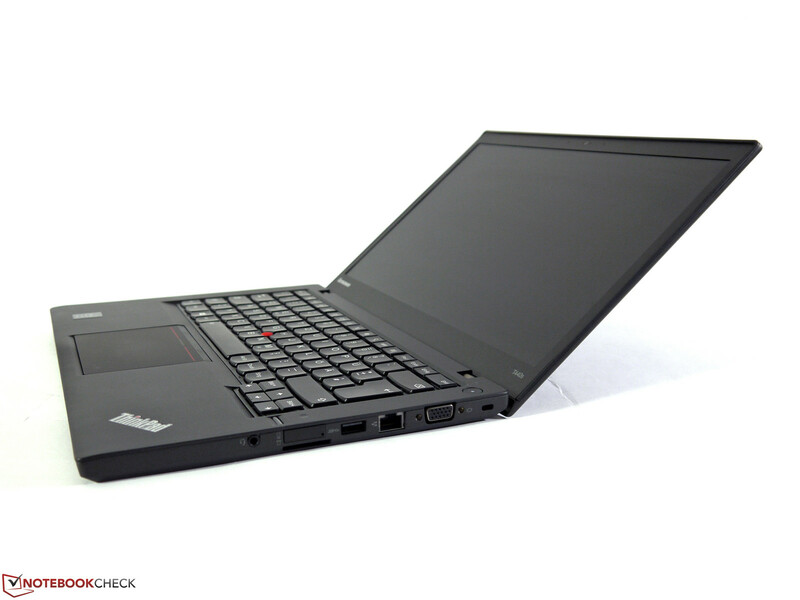 It is even about 200 grams lighter than our T430s test models. However, not only the weight, but also the small size of the 14-inch screen are both pleasing. 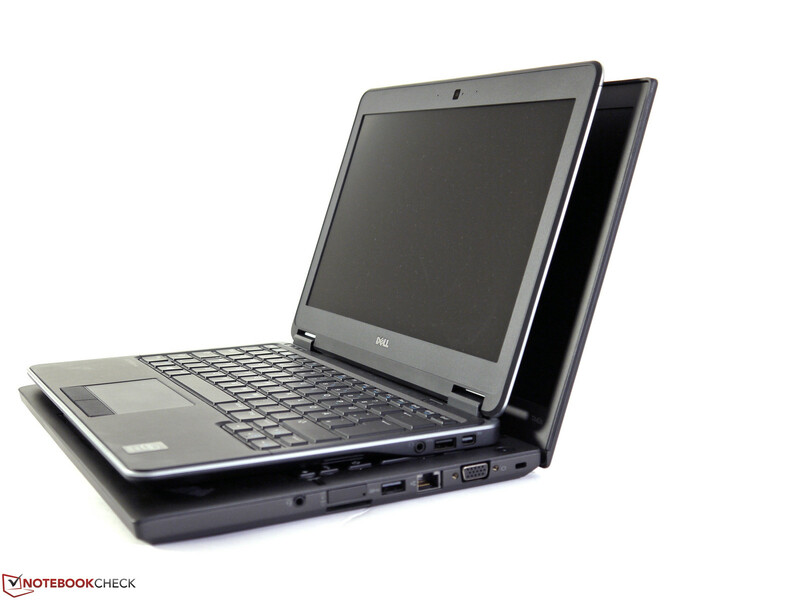 In comparison to the Dell Latitude E7240 that is equipped with a 12.5-inch screen, one must accept only little more in terms of width and depth of the case size. 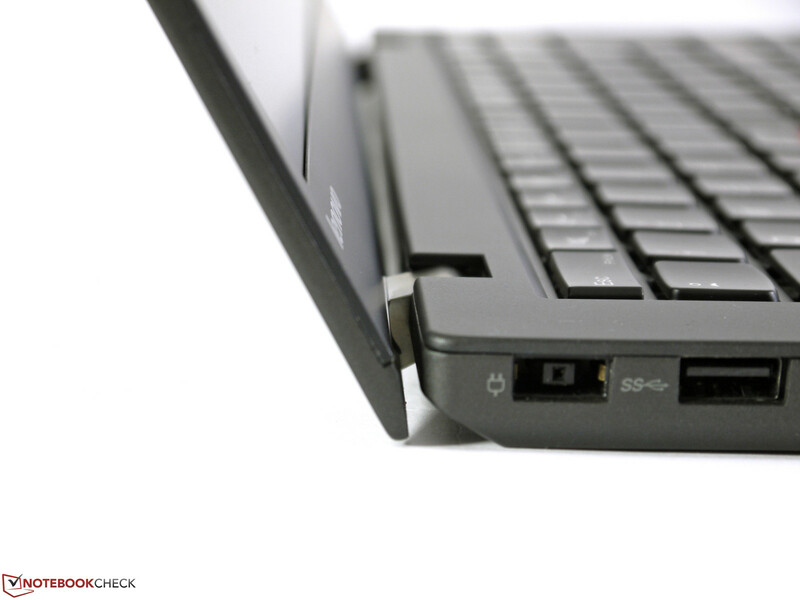 The ports of this laptop offer some specialties above the usual ultrabook level. Besides the digital mini display port, there is also an analogue VGA port built in. This one gives a sharp picture at 1920x1080 pixels and should be welcome in many companies. Furthermore, the SIM card for the optional Wi-Fi module does not have to be inserted into the battery slot, but can be conveniently inserted into the case through a small drawer on the side of the case. However, the plastic material that was used is very thin and does not give a very reliable impression. Practical experience will tell. Other than that a card reader, Ethernet and 3 x USB 3.0 suffice for mobile application scenarios. If more ports are needed in stationary use, then one can extend them via the classic way of a docking station. The docking station is located at the bottom of the device as usual, but it is only compatible with Lenovo's new CS13-Docking Basic, Pro and Ultra stations. For example, the basic variant (40A00065EU) is available for about 140 Euros (~$189). 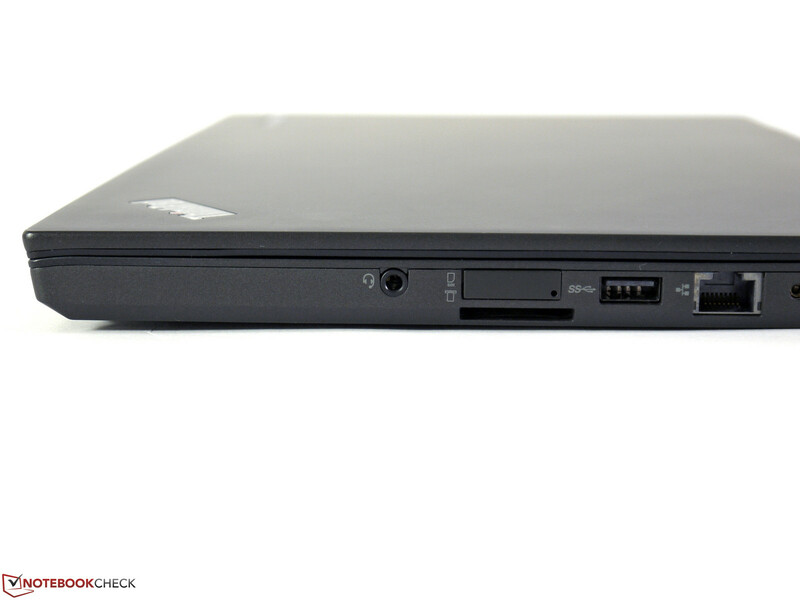 The optical drive that was still part of the ThinkPad T430s has vanished in the new model without any replacement. Users who do not want to go without will have to look for an external solution. 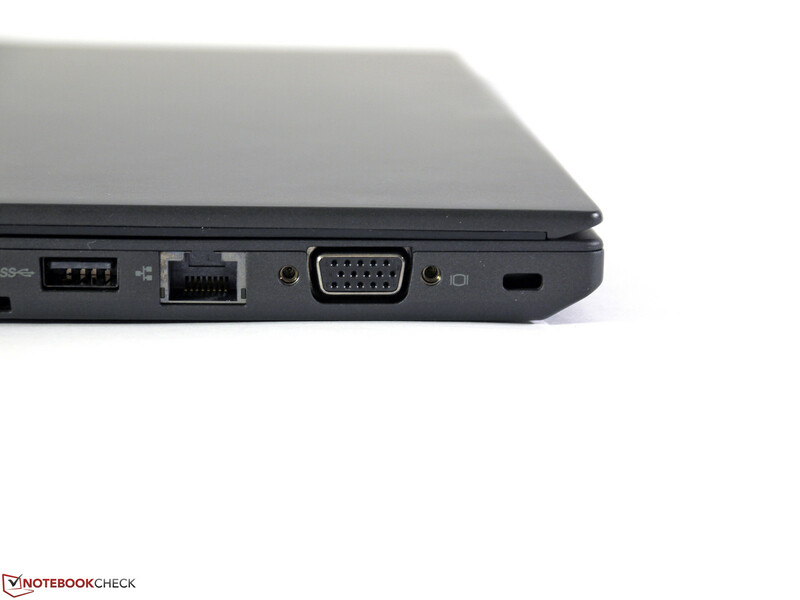 Right: Audio, SIM card slot, card reader, USB 3.0, Gigabit LAN, VGA, Kensington. Left: Power, USB 3.0, Mini-DisplayPort, USB 3.0, Smart Card Reader. 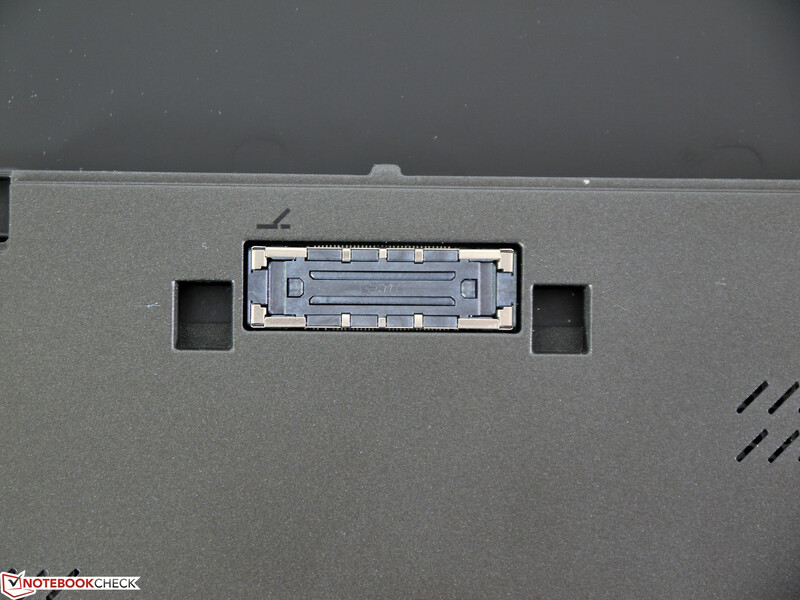 The Lenovo ThinkPad T440s contains an Intel Wireless-N 7260 module. It can operate in the 2.4 GHz band and in the 5 GHz band. It is equipped with 2 antennas and can reach a theoretical transfer rate of a maximum of 300 Mbit/s. We observed usual signal strength and a normal connection response to our 802.11n router with a Ralink RT2860T chip. We measured the Wi-Fi performance while having the router in sight at distances of 2, 5 and 10 meters. Here, the results vary between 3.2 MB/s and 5.7 MB/s. External factors, such as overlapping Wi-Fi networks could possibly disturb the transfer rates, hence these values are only approximate. The Intel module also has an integrated Bluetooth 4.0 chip which can control smartphones, mice or speakers over short distances. There is also a 720p webcam from SunplusIT built in for video conferences and a Gigabit Ethernet port enables connecting to a wired network. Here, Lenovo offers solid basic equipment. Besides the usual finger print scanner in this class range, there is also a Smart Card reader and a Trusted Platform module 1.2 (TPM 2.0 starting with Win 8). An NFC chip is available optionally and Intel Anti Theft as well as the Computrace Service can be activated in the BIOS (F1) when needed. Secure Boot was deactivated by default in the test model. The usual range of BIOS and system password options are also available of course. After the removal of 8 cross screws from the bottom of the device, one can remove the hatch and gain access to the important components. In addition to the screws, there are supporting clips in place here. Those have to be removed by applying a bit of pressure. We did not do this in the case of the brand-new test device out of respect for the lending provider. 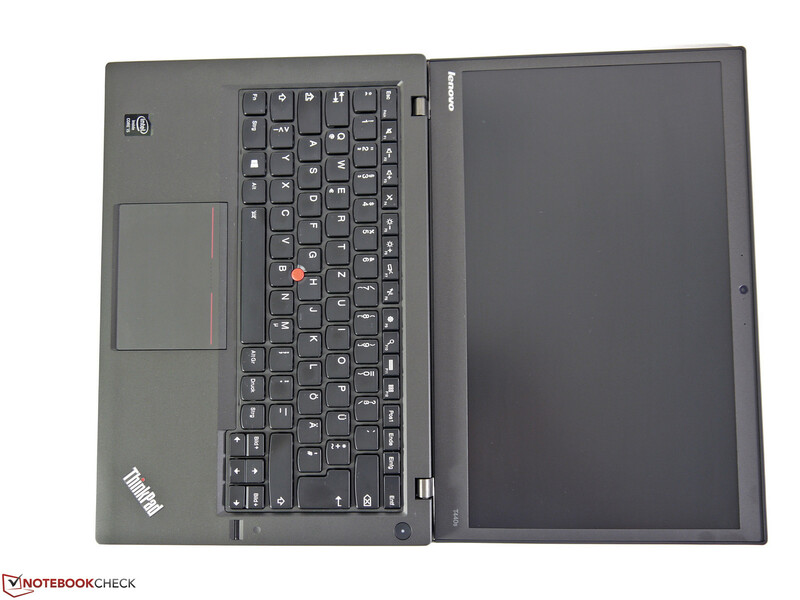 Lenovo's Hardware Maintenance Manual for the ThinkPad T440s explains all the required steps in detail and with pictures. Here, one can also find helpful advice for which components can be exchanged by the user himself. The RAM modules, the mass storage, the fan and the built-in battery can be accessed among others. In the test device there is also an M.2 slot that is not being used. It could hold an M.2 SSD or an M.2 WLAN card. The warranty period of 36 months corresponds to the usual standard for this class. Upgrades and extensions are optionally available. An extension to 48 months on-site service costs about 90 Euros (~$121), an extension to 60 months about 160 Euros (~$216). 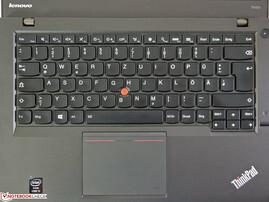 The keyboard with its chiclet design is excellent and represents the typical ThinkPad qualities. The keys have a medium short stroke, a good pressure point, and a relatively low noise tapping sound. The keypad is fixed and can be bent only very little. No bouncing of the buttons, rattling or other weaknesses were observed. The arrow keys for the vertical area are a critical point. They lie a bit close together and cause an improper operation from time to time. This is the only critical point though as the buttons are sufficiently large, arranged in the 19 mm array and labeled with a strong contrast. The integrated backlit display can be regulated with two levels and improves the readability in dark environments well. One can easily waive the ThinkLight that used to be integrated into the display frame. 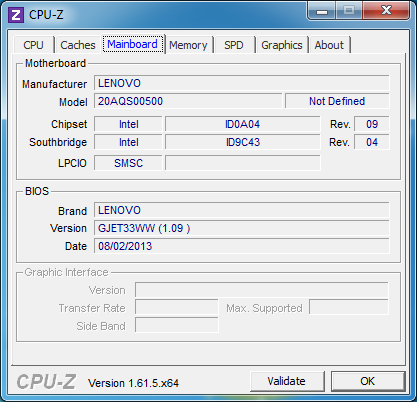 The layout has certain specialties that switching users first have to get used to as is often the case with Lenovo. 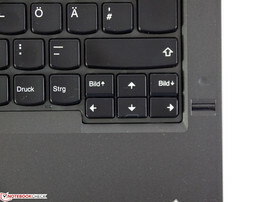 For example, on the left of the Space button the "Ctrl" and the "Windows button" have been swapped and the "Print Screen" button is on the right-hand side of the "Alt Gr" button. 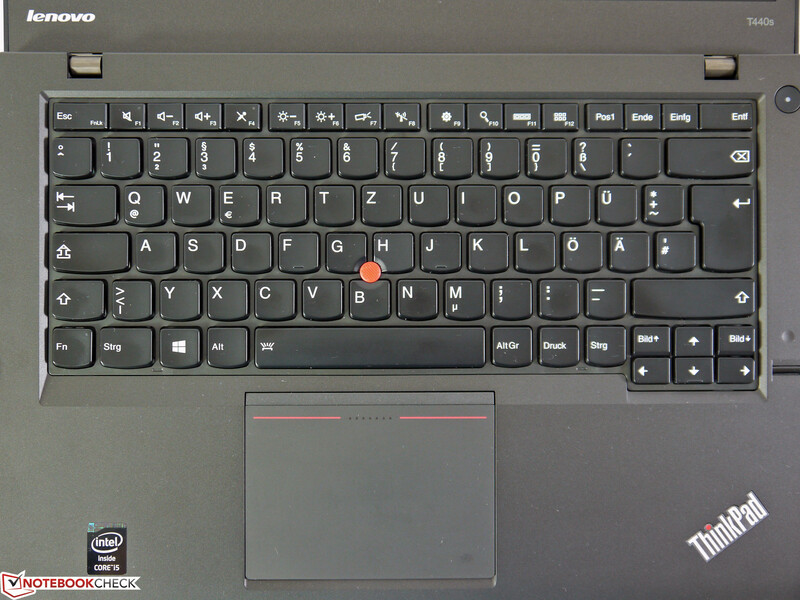 The audio buttons that used to be placed outside of the keyboard area in the ThinkPad T430s are now included directly as FN combinations in the keyboard layout. The Touchpad contains a 100 x 75 mm glass surface with very good anti-frictional properties. Multi-touch gestures are recognized very well and fingertips properly recognized. The input area can be pressed down as a whole and replaces the formerly separate touch and trackpoint buttons. 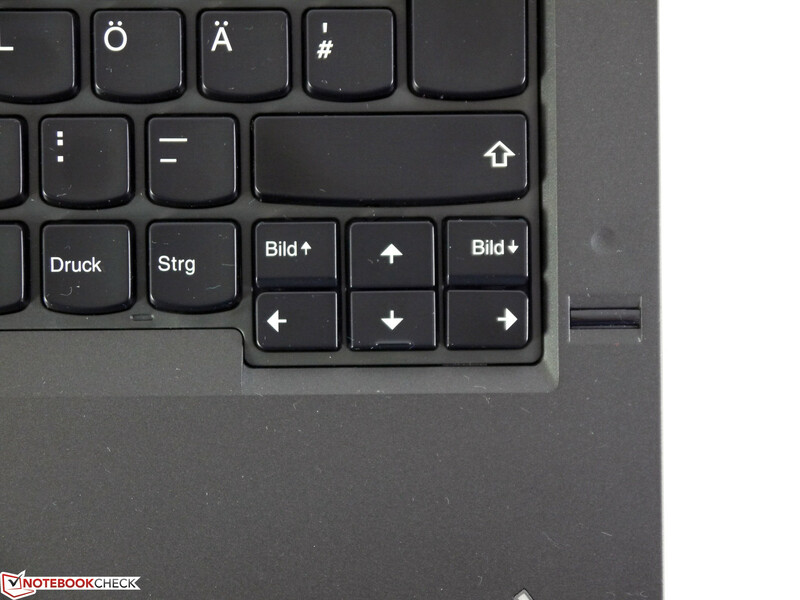 Lenovo calls this a 5-button clickpad. 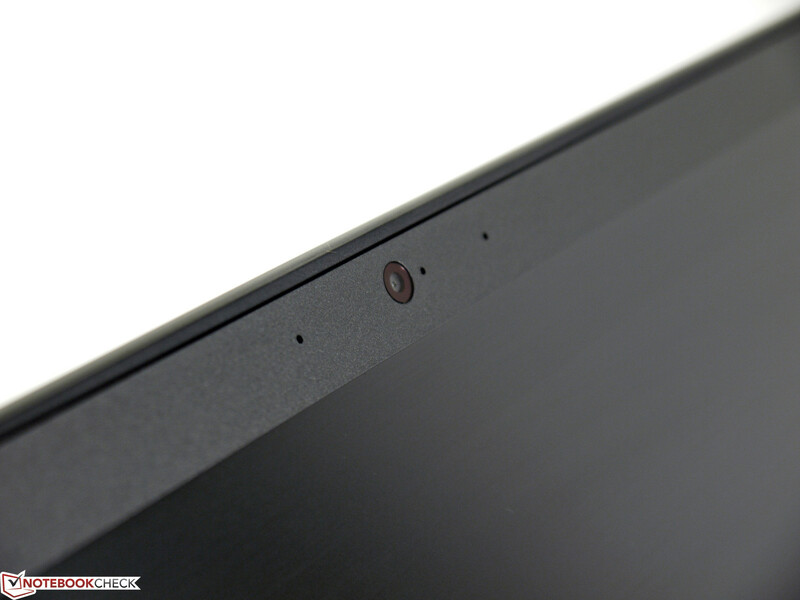 We registered a good feedback in the lower region where the touchpad buttons used to be. Furthermore, the left versus the right are distinguished very well. 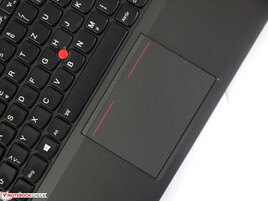 However, the touchpad does not work as well when it is combined with the trackpoint. Here, working with the upper region of the clickpad takes a lot of time to get used to and cannot keep up with the old standard solution of additional buttons in terms of comfort and reliability. Closely attached vertical arrow keys. 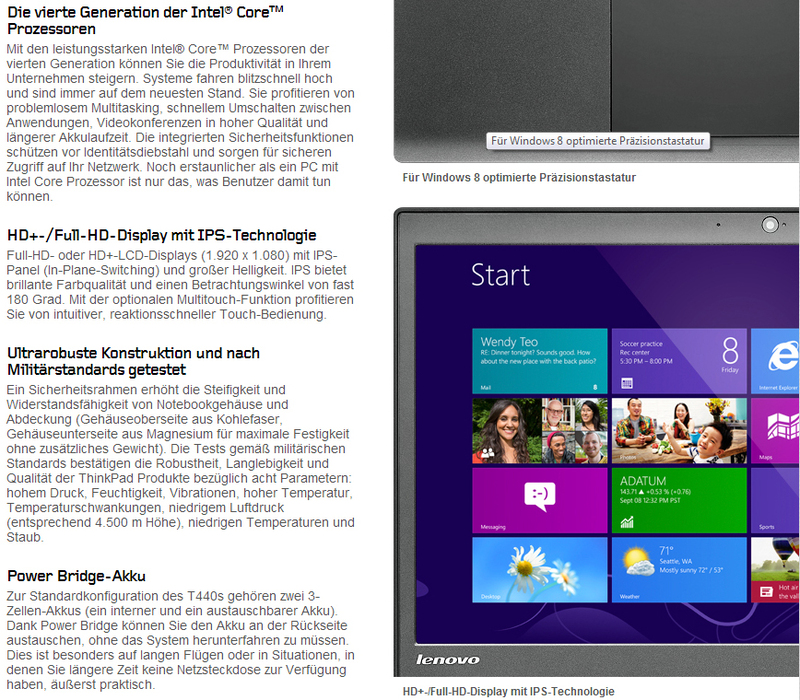 Lenovo advertises its product with an HD+ IPS and a Full HD IPS screen on their German website. However, this seems to be a translation error, since the English website clearly only marks the Full HD display as an IPS display. 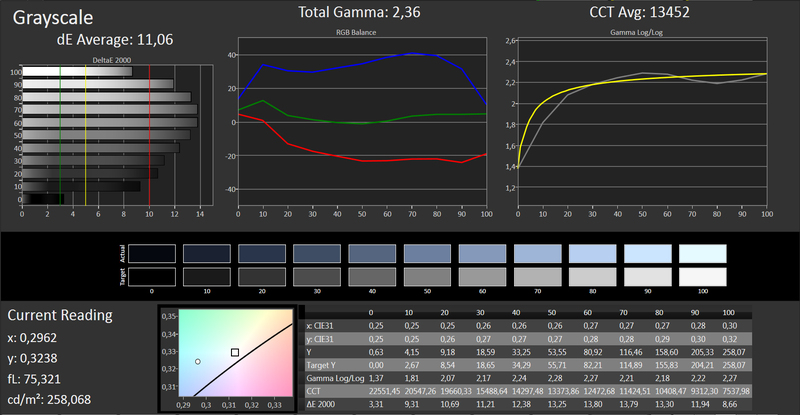 In fact, in our test device there really is a "normal" HD+ display with TN technology built-in. With 1600x900 pixels it features a pixel density of 131 dpi and should provide the right ratio of display size and work space for many users. The display from AU Optronics with the name B140RTN03.0 is said to offer a contrast of 400:1 and a brightness of up to 250 cd/m². We measured the maximum display brightness via nine measurement points as usual. 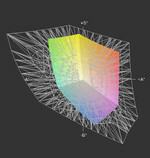 In the case of a homogeneous illumination of 91% the brightness values extend from a range of 211 cd/m² to 232 cd/m². With the Lenovo ThinkPad S440 Touch we may have found the same panel type, but that one has lit up much less with an average of 173 cd/m². This is presumably due to the additional touch surface. 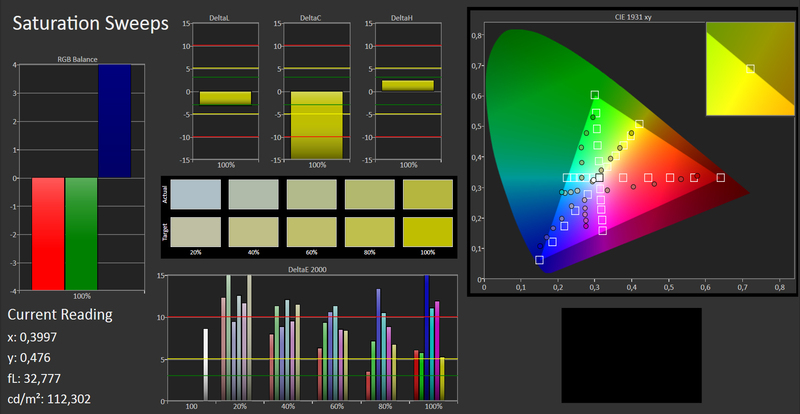 This is clearly sufficient for interiors and one can usually choose ergonomic brightness settings around 150 cd/m². We ran the Wi-Fi battery runtime test with a brightness level of 12 which delivers a brightness of 155 cd/m² in the center of the screen. 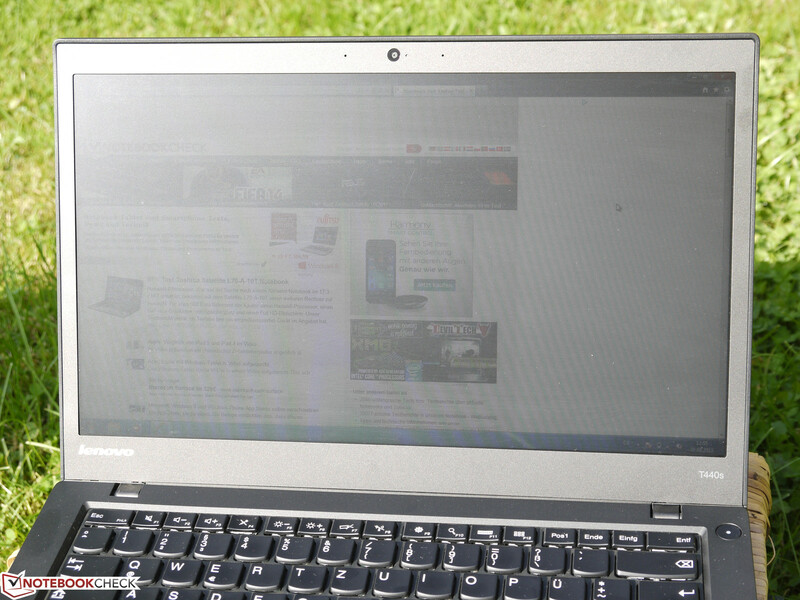 The ThinkPad T440s profits from a brightness that is not throttled in battery mode, for instance outdoors. 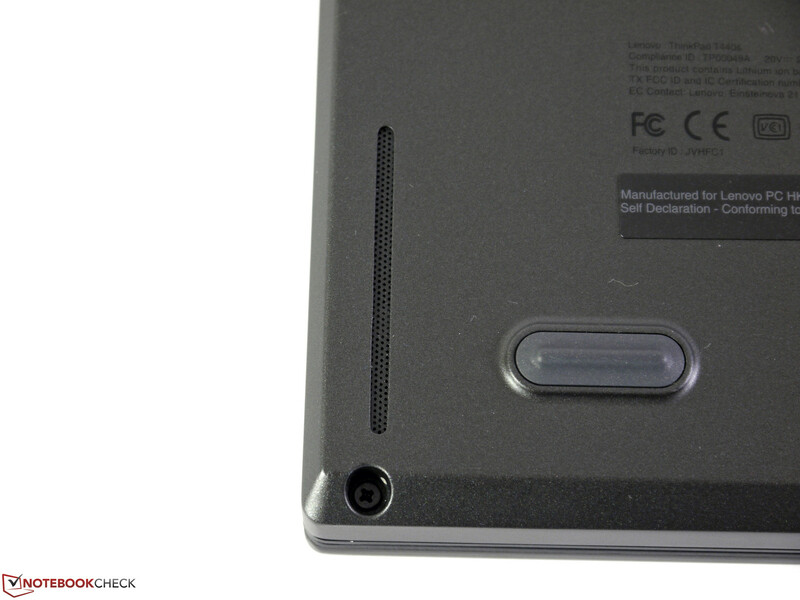 The matte surface of the test device allows seeing the content outdoors clearly and without any disturbing reflections. One still has to avoid direct contact with direct sunlight as otherwise nothing can be recognized anymore. The contrast is very low with a ratio of 237:1 and probably the main reason why the colors are not vibrant and that the black seems rather grayish. Therefore, in case of photos, films and games the presentation is not very lively and not very natural. 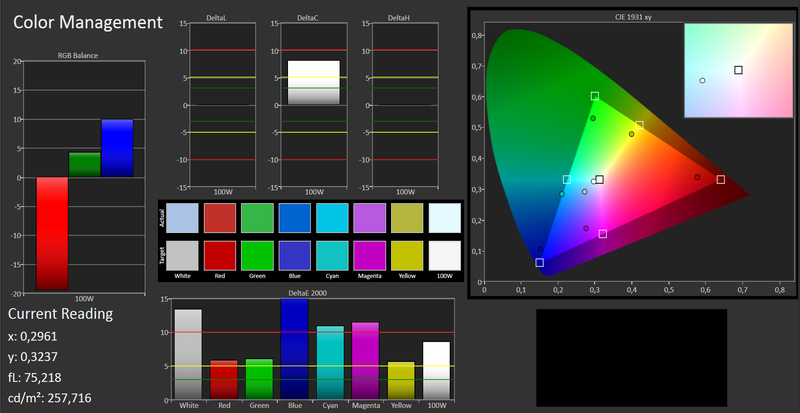 Also, the sRGB color space is only covered to about 60%, especially in the magenta, red and green areas one has to accept certain deficiencies. 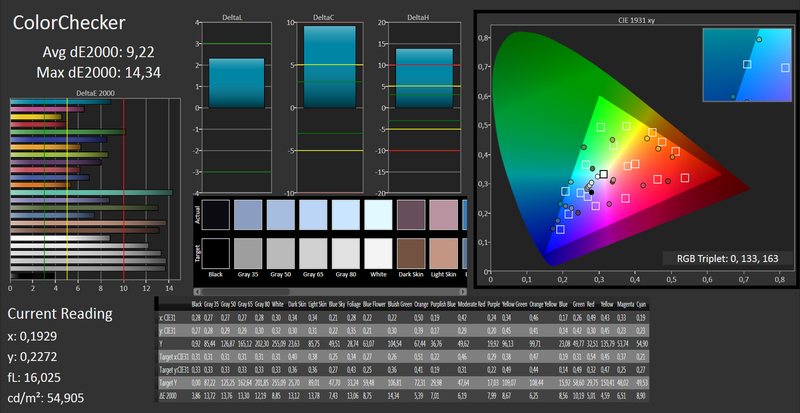 Further reasons why the display is not suitable for professional tasks in the field of image processing can be found in the additional display tests. 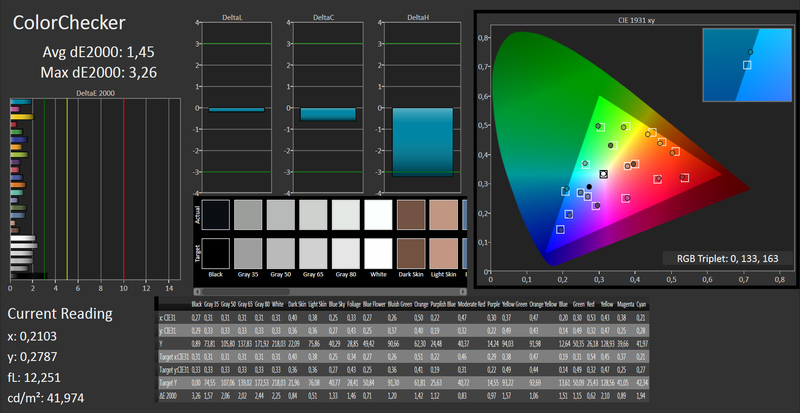 While one can drastically improve the bad initial values in terms of gray color resolution through calibration, this is possible only to a limited extent for color saturation and color precision. 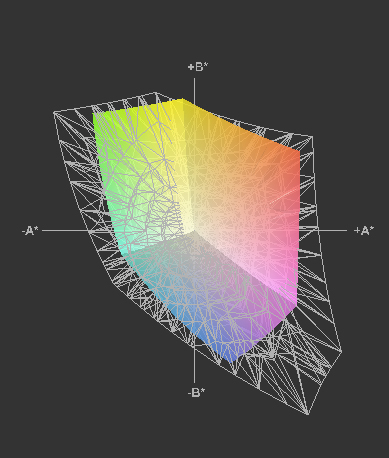 Above all, even then red, blue and magenta do not reach DeltaE 2000 values of less than 5. Here, covering the necessary color space is simply missing, e.g. pure red cannot be displayed anymore. 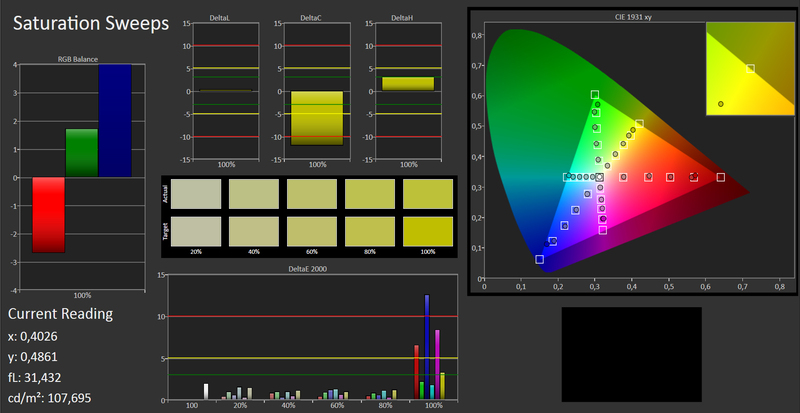 For mixed colors this effect is much less drastic, since in that case the missing color spectrum can be balanced a bit. 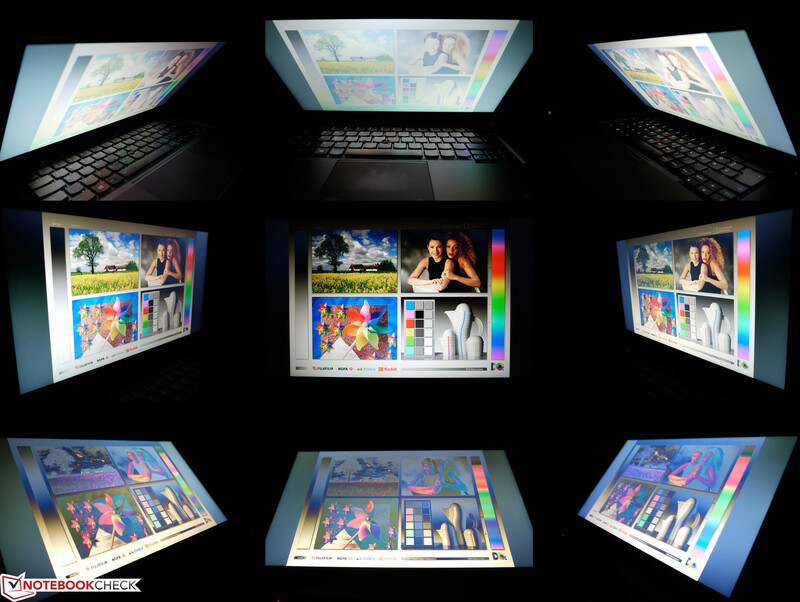 The viewing-angle stability of the TN panel only reaches the standard notebook quality level. On the vertical axis the colors either fade quite quickly depending on the angle of the display, or it comes to an inversion. On the horizontal axis the representation is affected only by a little in case of a change of brightness and stays clearly recognizable. In terms of performance so far only little can be said about the possible equipment options. Up to now the new T series is only available in two almost equivalent versions for people from Lenovo's education program. Wide availability is to be expected only from the official release date in November. At that time it will also become clear which components will really be deliverable and which ones can be configured. ULV CPUs up to Intel Core i7 of the 4th generation (Haswell) have been announced as well as hard drives of up to 1 TB, SSDs with up to 512 GB and a dedicated Nvidia GT 730M. 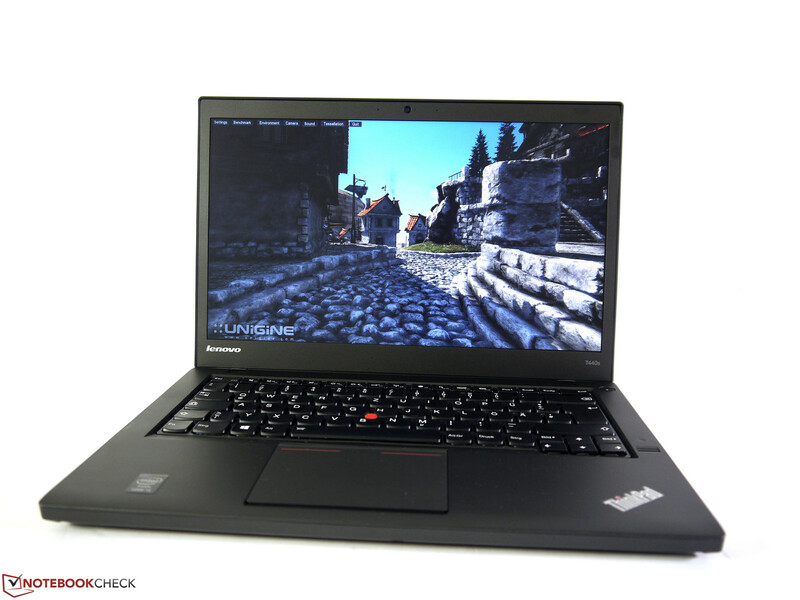 According to Lenovo the prices for the normal models are to be set at around 1250 Euros (~$1691). Our test device is powered by an Intel Core i5-4200U CPU chip that supports all the essential technologies, such as Hyperthreading, Turbo Boost and Quick Sync Video. 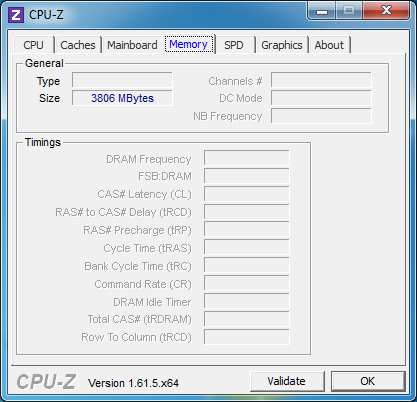 The basic clock rate is at 1600 MHz and can go up to 2600 MHz in single-thread tasks. The limiting factor for performance is the much reduced thermal design power of 15 Watts as is also encountered in other test devices. In addition to the CPU, this also includes the graphics unit, the storage control unit and the chipset. One mostly has to expect a reduction of the computing power when the CPU and GPU are claimed simultaneously. When both Prime95 and Furmark are running simultaneously, then the CPU clock rate is reduced to 1000-1100 MHz according to our tools. When the graphics unit is not in use, then we can observe a constant 2300 MHz. In the case of the Dell Latitude E7240 with the same Intel Core i5-4200U CPU we saw a much lower maximum reduction to 1600 MHz. Presumably, Lenovo has taken further action in case of the ThinkPad T440s in order to limit the consumption and heat emission. However, this does not have any influence on the benchmark results, including CPU benchmarks as well as graphics benchmarks (See the chapter on graphics cards). In the case of the Cinebench R10 64-bit benchmark 5002 points and 9963 points were achieved. The wPrime 1024m calculation is done in 658 seconds. The performance is roughly comparable to a regular Intel Core i3-3110M CPU which can use much more energy with a TDP of 35 Watts though. More comparison values can be found in our extensive CPU benchmark list. In practice, we converted video and audio files into other formats. We used either the pure CPU power or Intel's Quick Sync Video for this. The audio conversion via iTunes can be done with up to 39.6 times the speed and the conversion via Cyberlink's MediaEspresso is achieved much faster with Intel Quick Sync Video than in a pure CPU task (multi-thread). Have a look at the corresponding graphic chart for this as well. 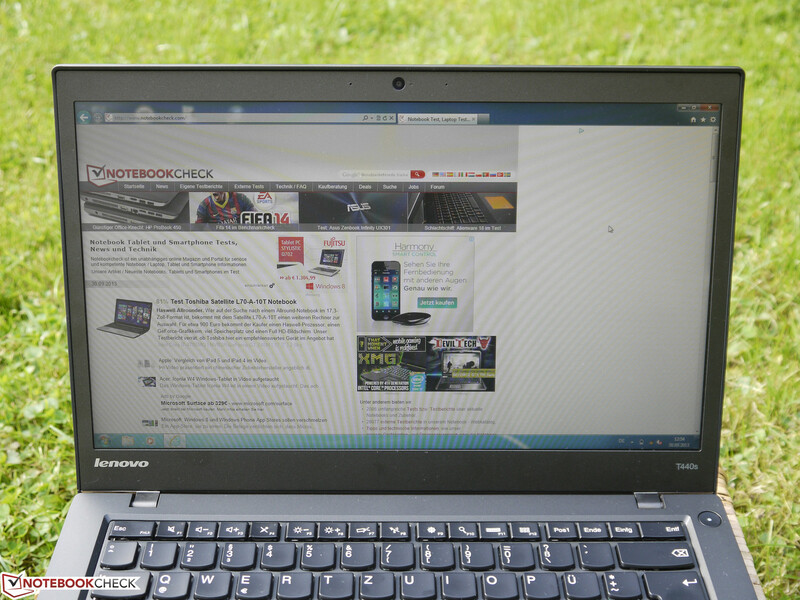 In comparison to the Dell Latitude E7240 the Lenovo ThinkPad T440s has some small advantages in the Quick Sync and the MP3 conversions, but is a bit worse in video conversion via CPU. We have not encountered any further reduction in performance in battery mode. The performed comparison benchmarks were within the inaccuracy of measurement. The system performance does not achieve all the potential because of the conventional hard drive and the RAM that is working in single-channel mode. The reading times and transfer rates of the mass storage, much lower than SSDs, result in a slow system start and an overall sluggish response when opening applications and files. The RAM will only work in dual-channel mode once a RAM module is plugged in (4 GB soldered) and only then it can reach full speed. This also has effects on the graphic performance, since the Intel HD Graphics 4400 serves itself part of the RAM in the shared-memory mode due to a lack of sufficient proper memory. Hence, the results in PCMark Vantage (6949 points) and PCMark 7 (2287 points) could be significantly better after resolving these system impediments. The Hitachi hard drive that is built into the test model works at a rotation speed of up to 7200 rpm and offers a pretty large capacity of 500 GB (gross). 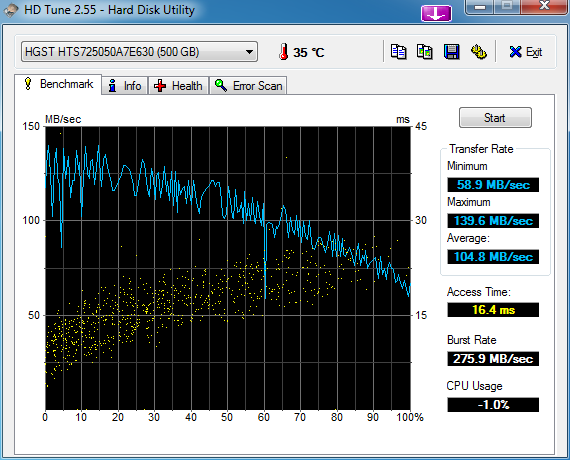 With transfer rates of up to 139 MB/s this is a pretty fast model in comparison to other conventional hard drives. However, the results are fairly modest in comparison to current Solid State Drives and they clearly show that the only reason not to use an SSD is the price difference. An extensive mass storage comparison list can be found in our HDD Benchmark list. Lenovo is going to offer supplementary mass storage options as soon as the T440s series becomes available for the broader market in November. The model overview contains hard drives up to 1 TB as well as SSD-cache modules and Solid State Drives of up to 512 GB. Until then it would definitely have to be a do-it-yourself project in order to get such a change. 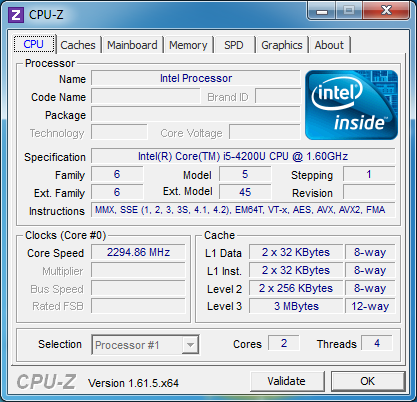 The integrated Intel HD Graphics 4400 uses the RAM in the shared-memory mode and reaches clock frequencies of up to 1000 MHz. The basic clock rate lies at a low 200 MHz and with this contributes its part to a low overall performance consumption under little load. Alternatively, Lenovo also offers solutions with dedicated Nvidia GeForce GT 730M graphics cards in the models that are to be released. These should deliver a much better performance in 3D tasks, however, for professional CAD tasks this solution as well as the Intel solution will not be sufficient. The graphics power of the Intel HD Graphics 4400 can be increased via an extra RAM module in addition to the soldered one, as was already mentioned in the system performance chapter. This is not the case for our test model so that the RAM is only working in single-channel mode. The results in the established graphics benchmarks come out as expected and they are far from dedicated graphics cards of the lower middle class. For instance, in 3DMark Vantage a score of 3412 points is achieved, in 3DMark 11 a score of 813, and in Cinebench R10 OpenGL Shading 64-bit 6023 points. In contrast to the CPU we have not noticed any reduction of the clock frequency in the graphics section under full load. 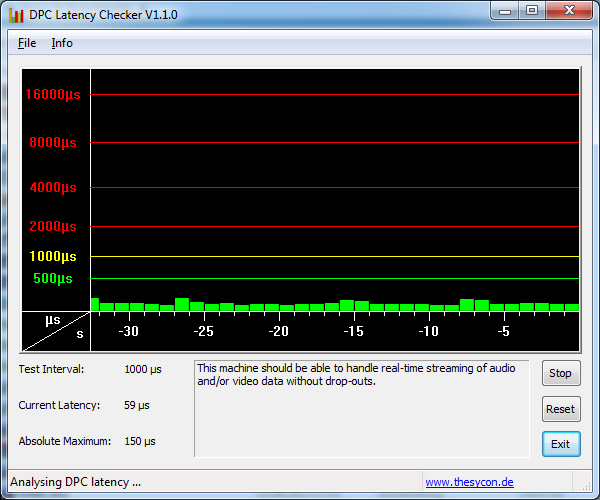 In this scenario the tools also show a clock rate of up to 1000 MHz. In battery mode there is also no direct performance reduction noticeable. The gaming performance is limited to low details and resolutions or in case of titles with low requirements, such as World of Warcraft, Torchlight and also F1 2012 on medium details. Using a trial and error approach one can still optimize it a bit too. For instance, World of Warcraft can even be played with a native display resolution of 1600x900 pixels and 71 fps, if low quality settings are chosen. 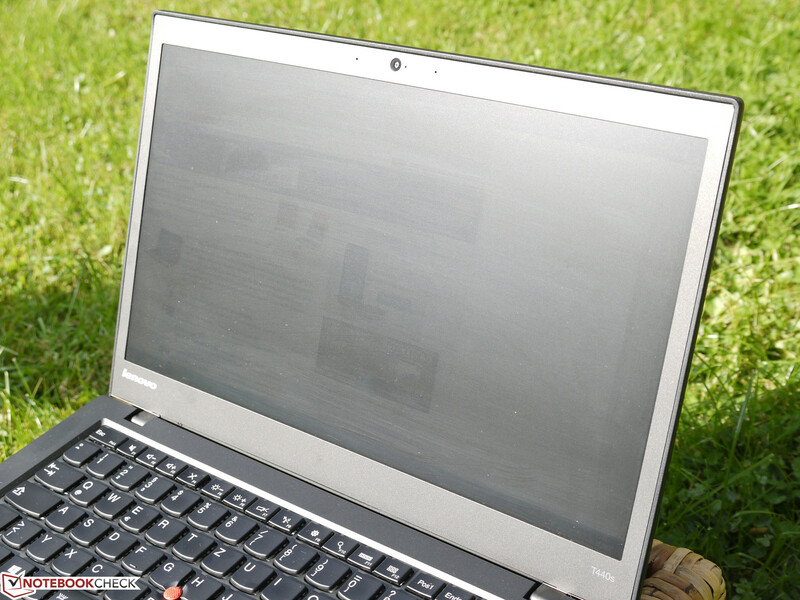 Lenovo is able to manage the noise emission very well in its current models. 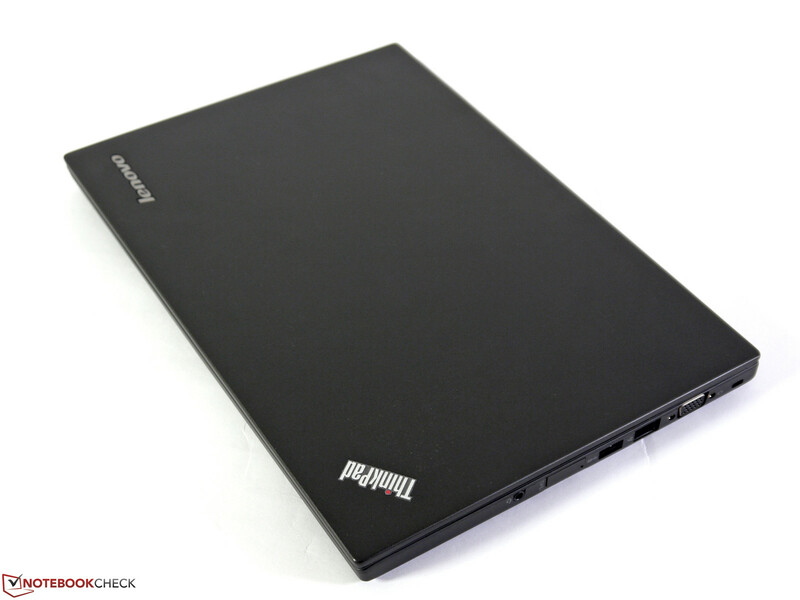 We have found notebooks that run at a very low noise with the ThinkPad S440 and the S531. 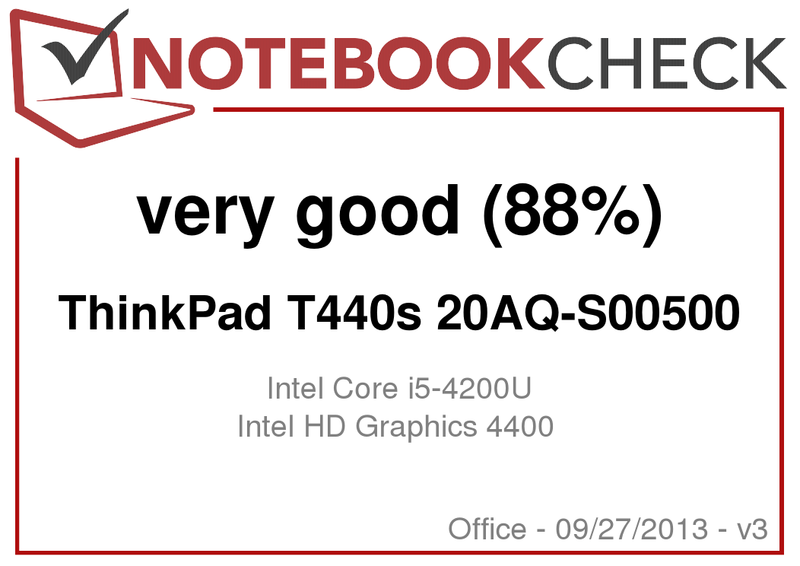 The ThinkPad T440s is no different here and convinces with a low noise level of 29.8 dB(A) under low load, despite a conventional hard drive. One could decrease the noise level even further with a Solid State Drive, since then the little noise of the drive would be canceled out as well. The fan spins significantly faster only when the graphics chip or the CPU receive more demanding tasks. Then the sound pressure level reaches 34.8 dB(A) under a medium load. This increases only marginally to 35.4 dB(A) under full load and is a clear effect of the reduced CPU performance with a simultaneous graphics load. The temperature development of the test device is not really noticeable. With a maximum of only 35.7 °C under full load at the central bottom one does not need to worry about any cutbacks. Even the 41.8 °C measured directly at the air inlet vent should not really bother anybody. Here, the performance reduction of the CPU in case of demanding graphics is very beneficial and keeps the case cool at a low noise level. 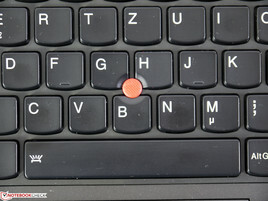 The speakers have been moved from the workspace at the side next to the keyboard (ThinkPad T430s) down to the bottom of the device. As always, they deliver mostly highs in the sound characteristic. This is sufficient for system sounds and internet tasks, but for presentations, films and games an external solution is required, which can be connected via the 3.5 mm input, USB or Bluetooth. Energy consumption ranges from 4.1 Watts up to 27.4 Watts. 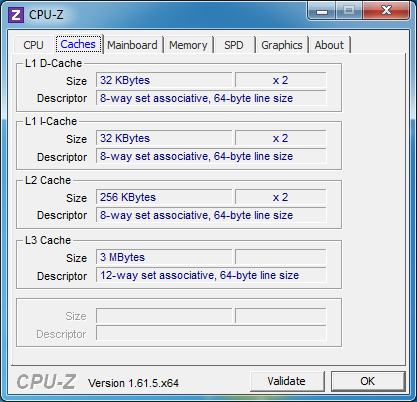 In pure CPU use one can measure highest values of up to 33.4 Watts, but rarely and they only last for a very short time. 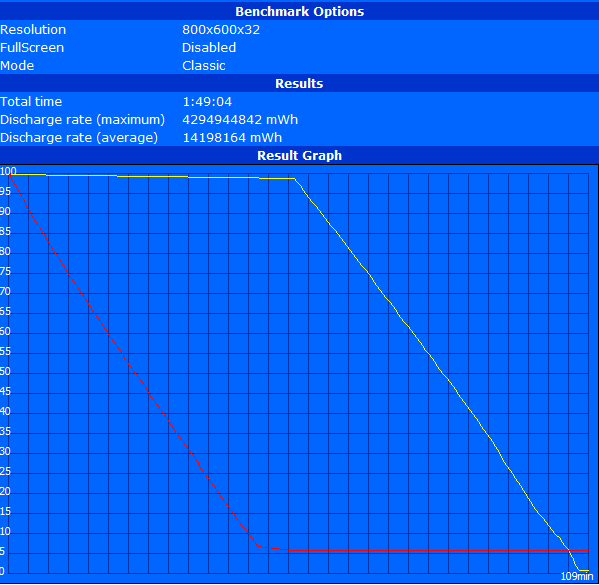 In the case of the similarly equipped Dell Latitude E7240 we measured constant values of 34.8 Watts under full load. This is due to the CPU that is not throttled and the simultaneous graphics load. The power supply with a nominal capacity of 60 Watts still has sufficient power reserves for variants with stronger equipment. 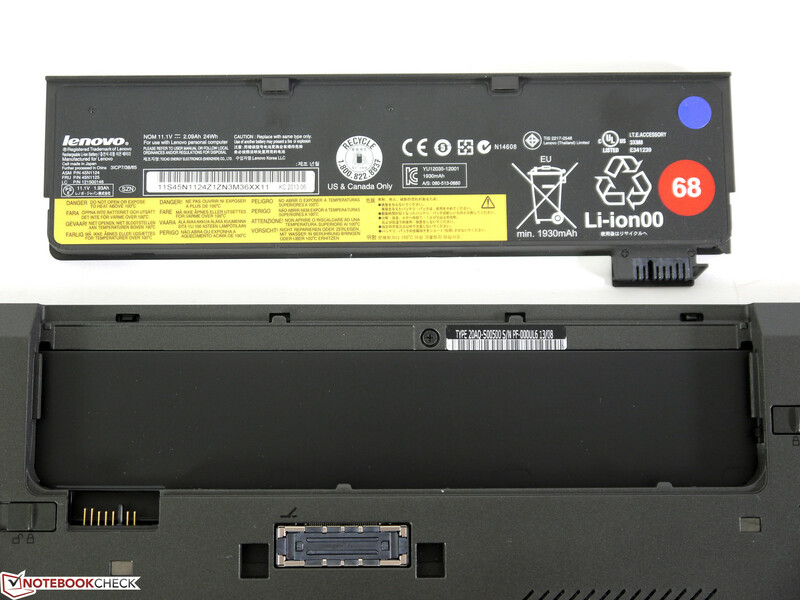 One of the fundamental upgrades in the ThinkPad T440s is the new battery concept named Power Bridge. 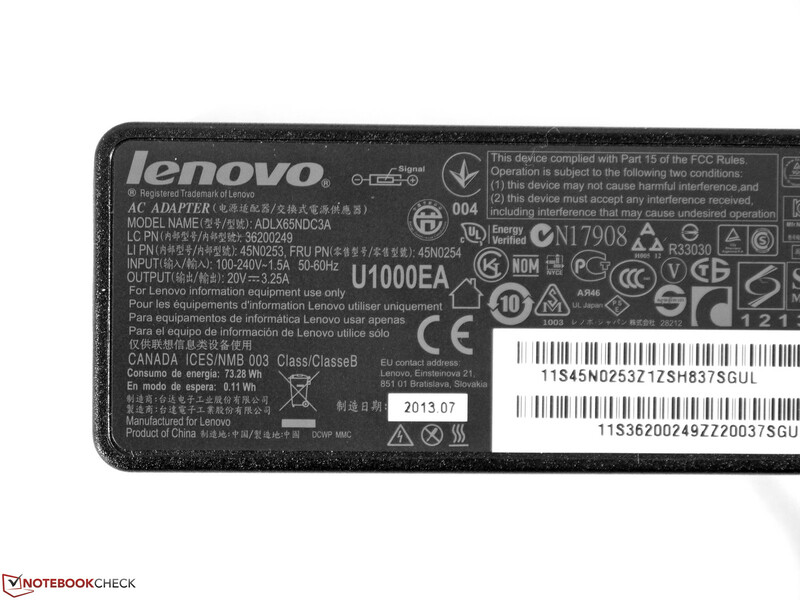 Lenovo combines a built-in battery with a capacity of 24 Wh together with a replaceable battery that can be removed from the bottom of the device just like in the predecessors. Our test model is equipped with another 24 Wh battery and, hence offers a total capacity of 48 Wh. 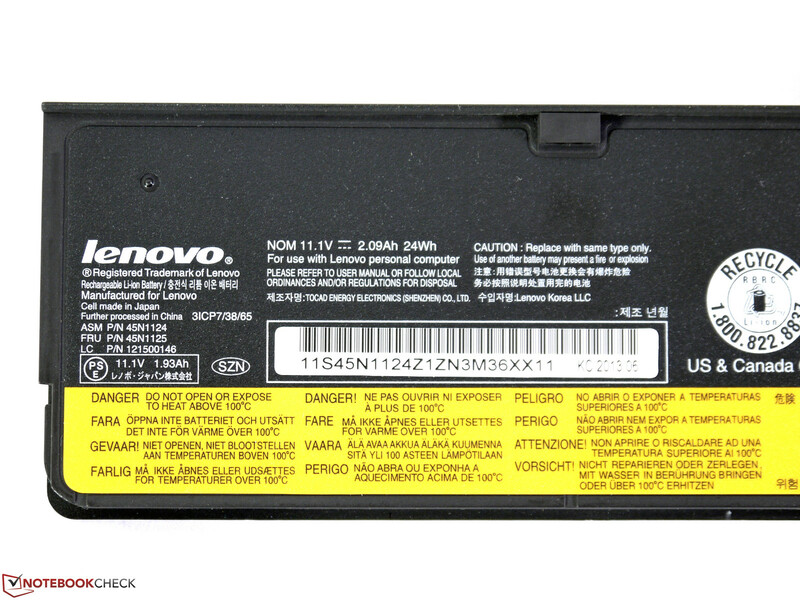 Lenovo has also announced a 6-cell battery 68+ with a capacity of 72 Wh (0C52862). This one should double the possible runtimes, but it is also much bigger and weighs about 150 grams more. The advantage of this 2 battery concept is mostly in situations where the battery has to be exchanged a lot so that the system does not need to be shut down during this process. Moreover, one has a higher failure safety when one of the batteries is not working well anymore. The low total consumption is the main factor why the comparably low battery capacity of 48 Wh can deliver great battery runtimes. In the Battery Eater Reader's Test (maximum energy saving options, minimum display brightness, Wi-Fi off) the ThinkPad T440s reaches more than 11 hours of battery life with just the small extra battery. However, this brilliant result only shows what is theoretically possible and, hence has little to do with real work performance. Therefore, the battery runtime is much shorter if the Wi-Fi module is in use such as during web surfing (Energy saving profile, brightness level 12 (155 cd/m²), Wi-Fi modules on). Here, the increased display brightness and the Wi-Fi module cause a bigger consumption. In this case only 6 out of the 11 hours remain. The system profits from throttling the CPU performance under full load and still reaches a very good 109 minutes in the Battery Eater Classic Test (Highest performance profile, maximum brightness, Wi-Fi modules on). 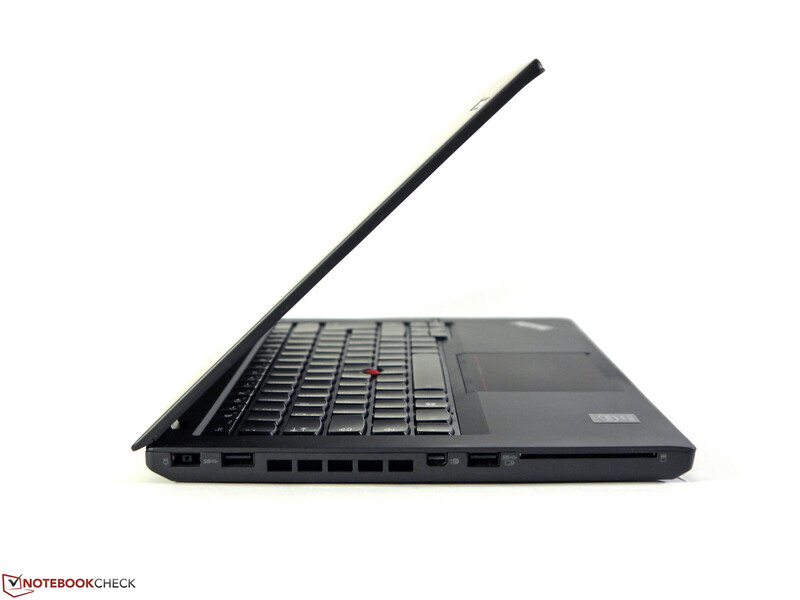 The Lenovo ThinkPad T440s has a clear goal, namely the top. Even the basic model of the Lenovo education series is convincing in many aspects. 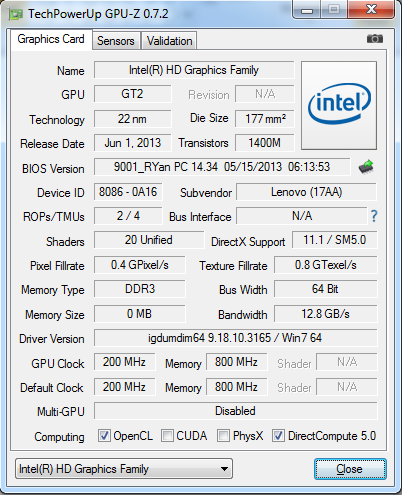 Despite the use of Intel's weaker ULV chips and the conventional hard drive, the application performance is very good. In contrast the noise emissions, heat emission and the battery runtime profit from the low consumption. The ThinkPad T440s always stays at a low noise, never gets uncomfortably warm and at the same time also delivers good battery runtimes. Comfortable equipment details like the backlit keyboard, the power bridge battery concept and the full-fledged docking port are a great extension to the very good basic properties like the low weight, the successful keyboard, the vast amount of ports, and the good stability of the case. 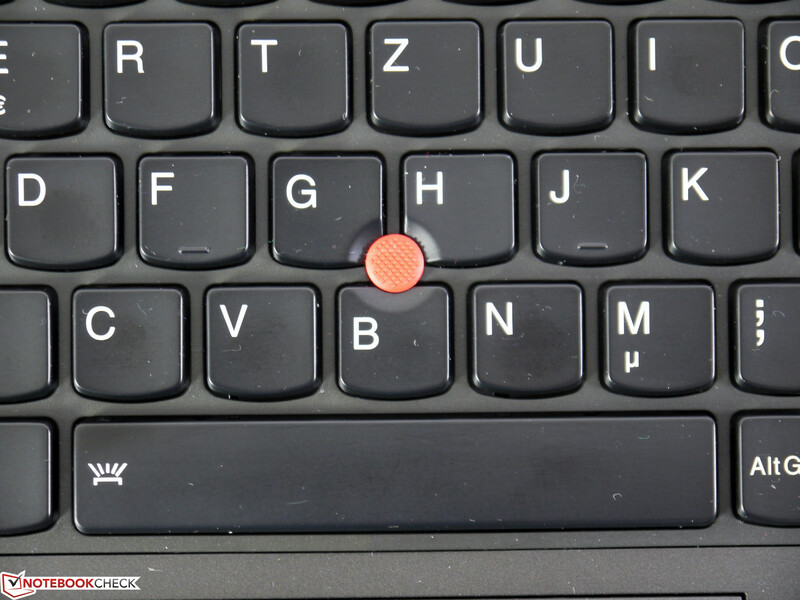 We consider the 5 button clickpad as not very successful when it is used together with the trackpoint. Here, we liked the initial concept with separate buttons much better. Overall, the display can definitely be used for business and scores with an HD+ resolution, a good brightness and a matte surface. However, the vertical viewing angle, the narrow color space and the low contrast should be improved and this not only for professional use in image processing. 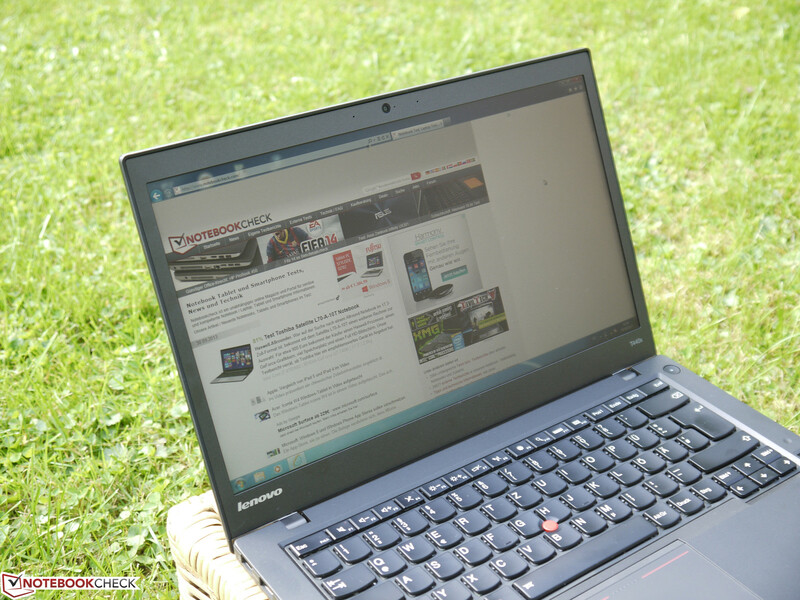 All in all, Lenovo succeeds in delivering a convincing entry with the ThinkPad T440s. The minor issues can be solved through an alternative configuration and adjusted to the individual requirements. The crucial points will only be the actual prices as well as the test of patience until the actual release in November. 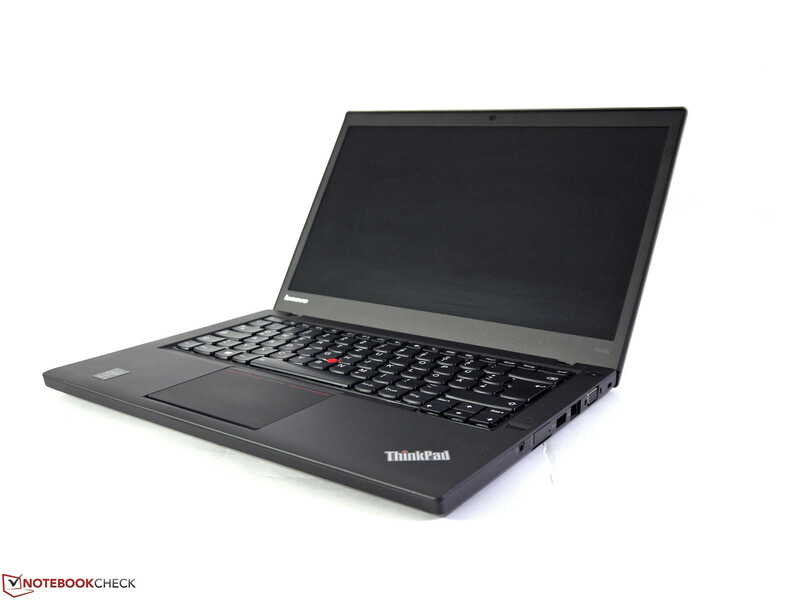 The Lenovo ThinkPad T440s successfully continues the tradition of the legendary ThinkPads. 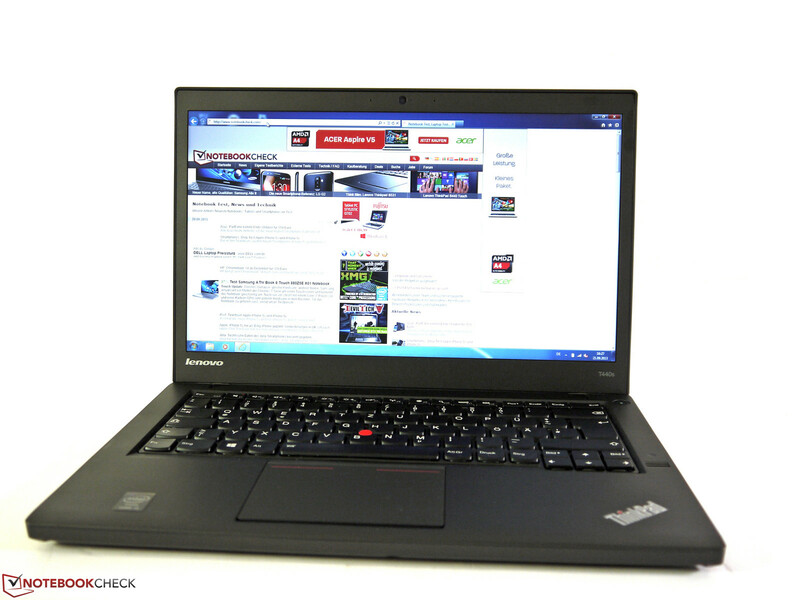 It has many new features compared to its predecessor, the ThinkPad T430s. ...there are also many changes to be found in the details. 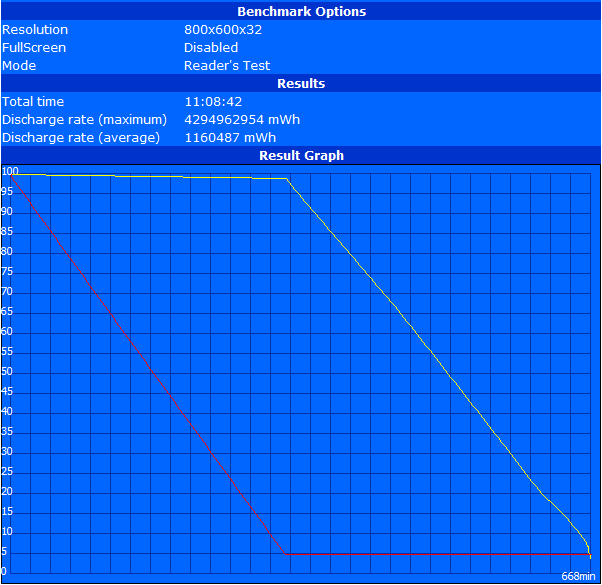 Despite a ULV CPU and a conventional hard drive, the application performance is very good. The equipment of the test device is very extensive and fulfills almost all wishes. For instance, WWAN, SSD or a Full HD display can be configured optionally. The keyboard is of high quality as usual and is also backlit. 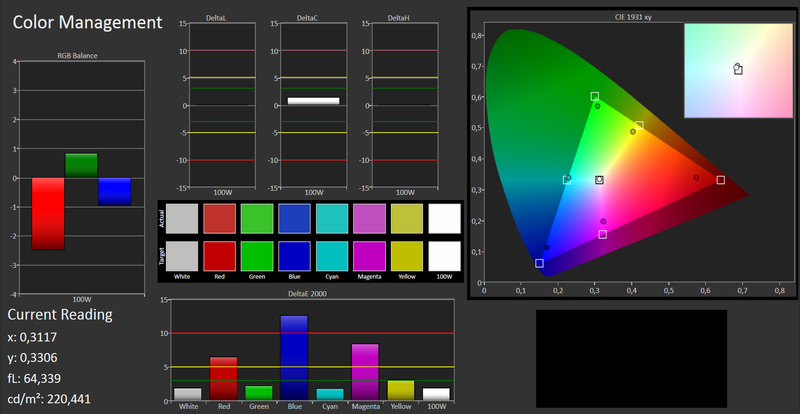 The display convinces with HD+ resolution, good brightness and a matte surface. 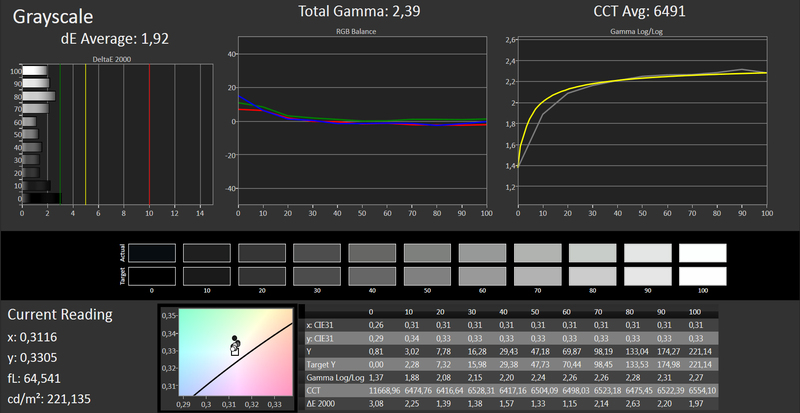 Contrast, viewing angle stability and color space could be better though. The 720p webcam is surrounded by dual-array microphones and works well for video conferences. ...when external peripheral devices are connected. The hinge of the screen keeps it in position very well. In contrast to the T430s the speakers are located at the bottom. The power cord sticks out quite rigidly. The screws and the bottom below have to be removed in order to access the components. The docking standard has changed and requires new docking stations. The replaceable battery of the test device and the built-in battery both have..
...a capacity of 24 Wh. The power supply has more than sufficient reserves with 60 Watts. 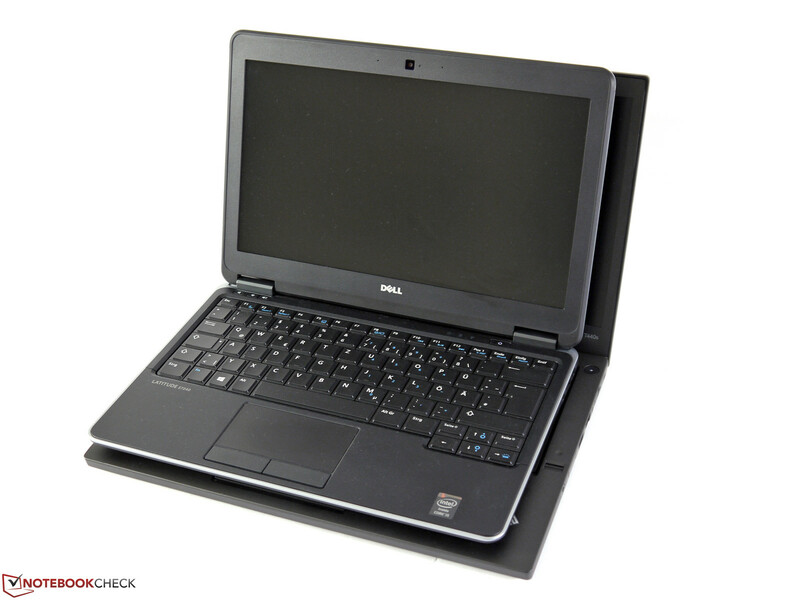 ...than the 12.5-inch Dell Latitude E7240. 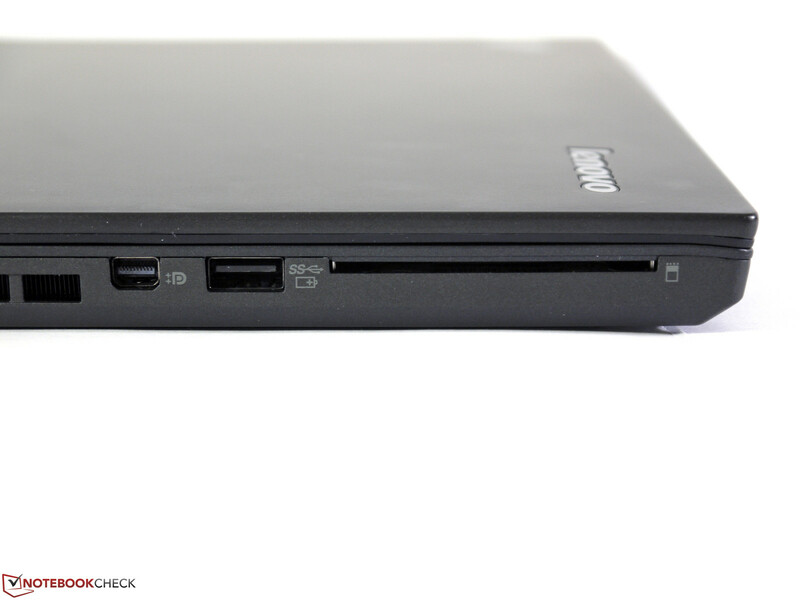 The Lenovo ThinkPad T440s offers many basic properties that are refined with a lot of interesting details. 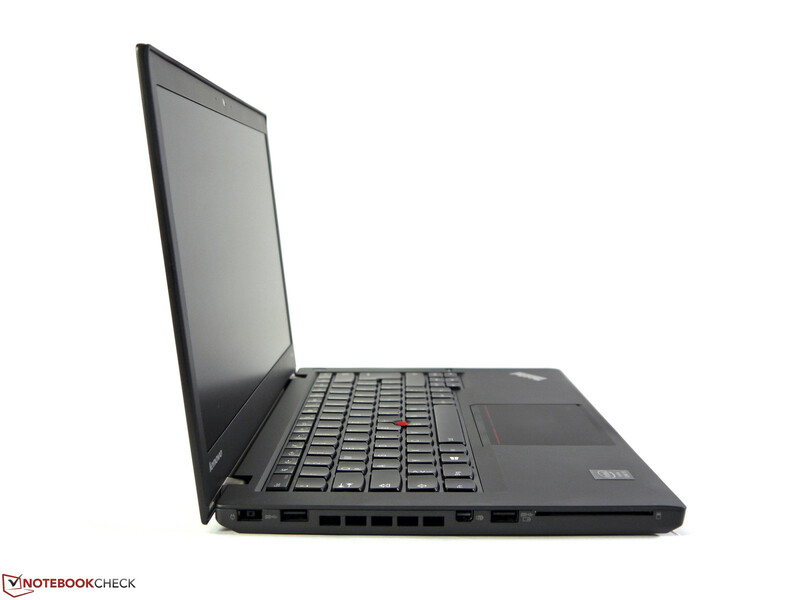 High mobility together with very low emissions, great workmanship and quality are at the core of the T440s. Except for the missing trackpoint buttons, all the missing pieces can be made up for by choosing the right components. SSD, IPS Full HD display and a dedicated Nvidia graphics card should fulfill most requirements. Through the EDU channel the T440s ThinkPads with limited configurations are already available way before the actual release date. 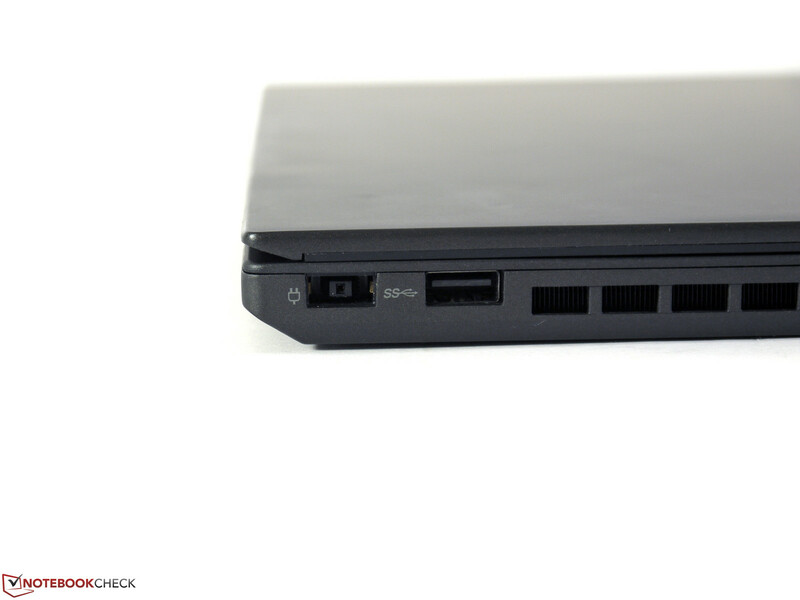 Lenovo ThinkPad S440, Dell Latitude E7440 and various models of previous years.